If you didn't know any better you would of thought that Monday Night Football was the game played in England this week with all the rain they had. Instead, what we got was a struggle to produce offensively for both teams in Carolina until the very end and no it was not because of stellar defensive play. The rain almost won the IDP Hero of the week with how many turnovers and loose balls it created, but I figured I couldn't give Mother Nature the nod since she is a free agent. Of course, there were other games outside of just Monday night and some of them had great defensive play by individuals and teams. I mean, did you see the Broncos D hold Aaron Rodgers to 77 yards passing (you read that right, and no he wasn't hurt)? They really only allowed the reigning MVP to get 77 yards in the air, he played the whole game if you were wondering. The Broncos D reigned supreme, but other teams had great showings also, such as, the Patriots, Rams, Chiefs, and Texans. Not so much for teams like the Giants and Saints who combined for a total of 101 points together. 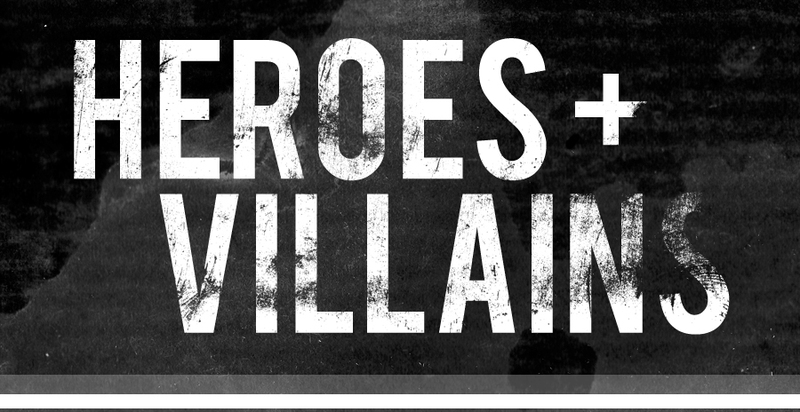 I get it though, less talk and more crowning of the Hero and Villain, I know. This week's villain comes from that rainy game in Carolina that was just sloppy all around. Now, for those of you wondering, my villain can be from a winning team. I did it last week, you can check, but sometimes even guys on winning teams are IDP Villains. I mean when they are the guys that cost more than the average player and perform like a bench player, it's going to hurt a lot of people. This week it goes to a guy that is a true hero off the field, but when he cost you $8100 and was averaging 10.53 fppg you expect a decent game. Instead, this weeks villain gave us a grand total of 1.50 points. That means he averaged less than .40 points per quarter and OT and that is why Thomas Davis of the Carolina Panthers is this week's Redraft Hero IDP Villain. Don't get me wrong Davis is a saint off the field, but this week on it he could not do a thing defensively. Taking up a chunk of your money and not even getting you 1 entire point, just 1, is not cool. 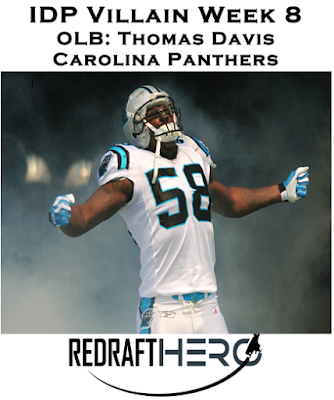 I expect this villain to turn back to the good side next week, but for now Thomas Davis might as well be called "Jigsaw" because he was a puzzle this week. The hero of the week has a sad and happy tone to it. 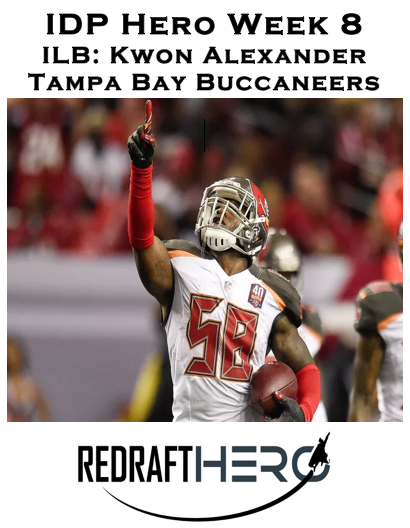 Kwon Alexander is the Redraft Hero IDP Hero of the week as a rookie for Tampa Bay. The sad part is Kwon played against the Falcons with a heavy heart, his 17 year old brother was killed less than 48 hours before he took the field. He dedicated the game to him and played his heart out, leading the team with 11 tackles and assists, an interception, and fumble recovery. He finished with 18.5 points for the game and only cost $6400 this week. He was without a doubt the reason Tampa Bay came out with the win against Atlanta and helped anyone that had him this week most likely win. It is always hard when tragedy strikes someones family, the fact that Kwon Alexander was able to still play and perform as he did is the exact reason why he deserves to be the IDP Hero of Week 8. I hope he comes out the rest of the year and balls like his brother always wanted him too. Best of luck Kwon and wish you nothing but the best.